The Price Point On This Unit Is Very Low Compared To Others In A Similar Class. Comes With Remote Control & A 24 Hour On/Off Cycle. Complaints Of Unit Not Working Out Of The Box, But Warranty Will Cover You. The Product Can Get Banged Up During Shipping To Your Home. Some Complaints Of Fan Rattling Causing A Very Loud Operating Environment. If You Have A Room Greater Than 450 Square Feet You May Want To Go Up In BTU Rating. Hello folks and welcome to RefrigerantHQ! Today we will be taking the time to do one of our product reviews. Over the past week or so we have been putting a lot of attention on window air conditioners and today is no different. 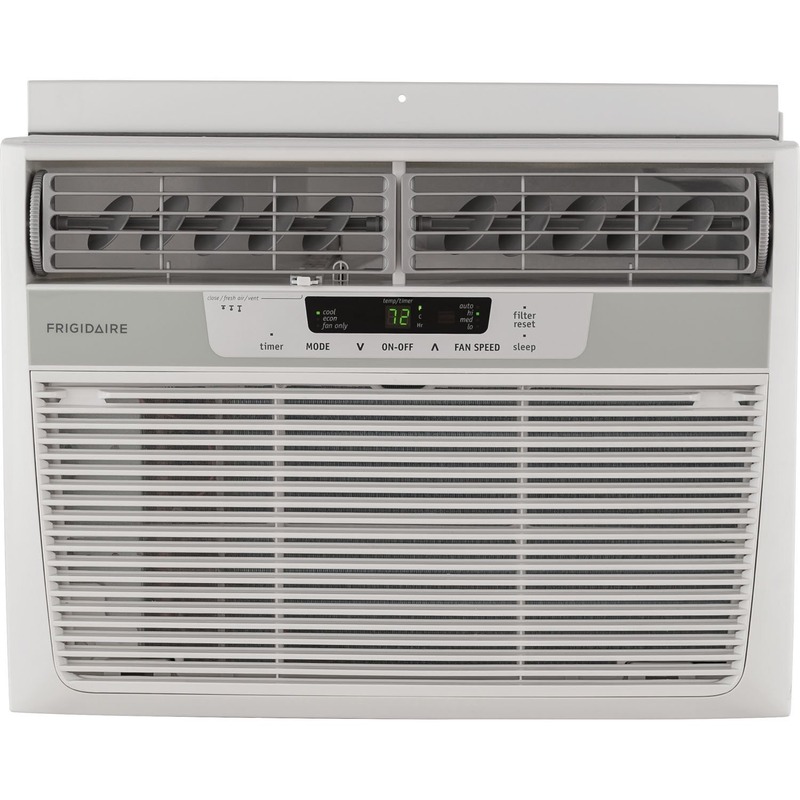 Today’s featured product is Frigidaire’s FFRA1022R1 10,000 BTU window air conditioning unit. Window air conditioners can be a lifesaver, especially in homes or apartments where a traditional split level air conditioner isn’t an option. But, what kind of product should you get? 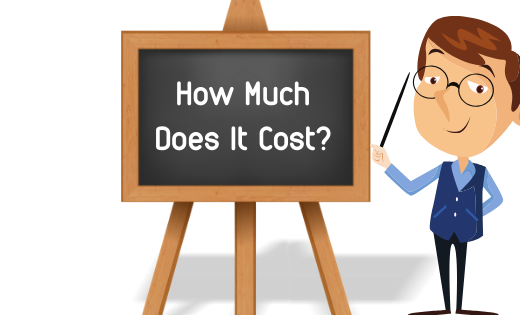 Is the FFRA1022R1 the right machine for you, or should be you looking elsewhere? Well folks, let’s dive in and find out! Now before I get into the actual details, Pros, and Cons of a product I always like to take some time and look at the company behind the product. After all, the manufacturing company can say a lot about the quality of the product. Brand names have power. Don’t believe me? Just ask Coca-Cola or Toyota. 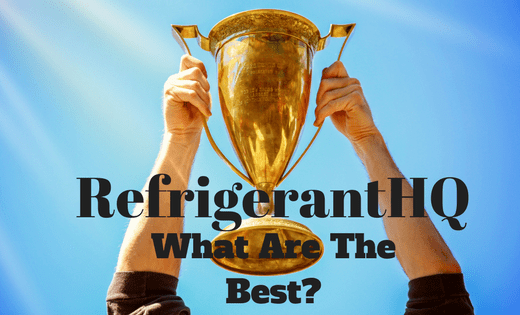 The Frigidaire company was my runner up for best brands in window air conditioners. If you haven’t heard of the company Frigidaire before I have to ask where have you been? You’ll see this brand name all over your house. I don’t care if it’s on your refrigerator, your dishwasher, or your laundry machine. These guys are into every home appliance you can imagine. The Frigidaire company knows exactly what they are doing with air conditioners and refrigeration units and have been around for over one-hundred years. Frigidaire was a pioneer in the refrigeration and cooling industry. They invented and began commercially selling the first self-contained refrigerator all the way back in 1916. Think about that for a moment. Over one-hundred years ago and Frigidaire was around and selling refrigerators. In fact one of their principal investors was William Durant, a founder of General Motors. GM went on to develop the first ‘Freon’ refrigerant in the 1930s while they were partnered with DuPont. This company has a solid history in the air conditioning and refrigeration industry. I can assure you that you are getting a great product when you purchase under the Frigidaire brand name. 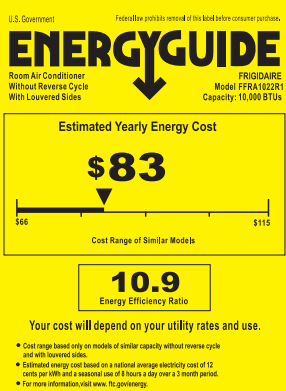 The Frigidaire FFRA1022R1 is rated at 10,000 BTUs. BTUs are the traditional measurement unit of heat. In the air conditioning world BTUs are a measurement of the cooling capacity of your window air conditioner. 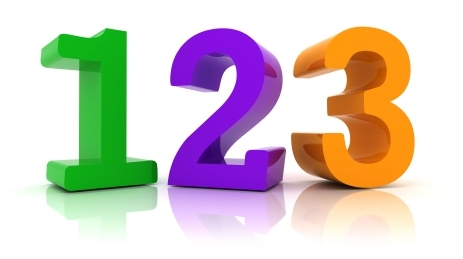 The bigger the number of BTUs the more powerful and the higher cooling capacity of your A/C unit. As a standard measurement an air conditioner needs around thirty BTUs for each square foot of living space that you wish to cool. In this case 10,000 BTUs is rated to cool around four-hundred and fifty square feet. That could be the size of a large master bedroom, a living room, or a small studio apartment. This unit is also rated to dehumidify at 2.7 pints per hour. This unit comes with a one-hundred and fifteen volt plug in. While this may seem like an odd thing to mention it is worth noting that larger BTU window units make as witch over to a two-hundred and twenty volt outlet. These types of outlets are the ones you find in your home for your oven or your dryer. With this one-hundred and fifteen volt outlet you are good to plug it in in any room without worry. The power cord on the FFRA1022R1 extends to six and a half feet. That should be more than enough space to reach the nearest outlet, but worst case you can always use an extension cord. 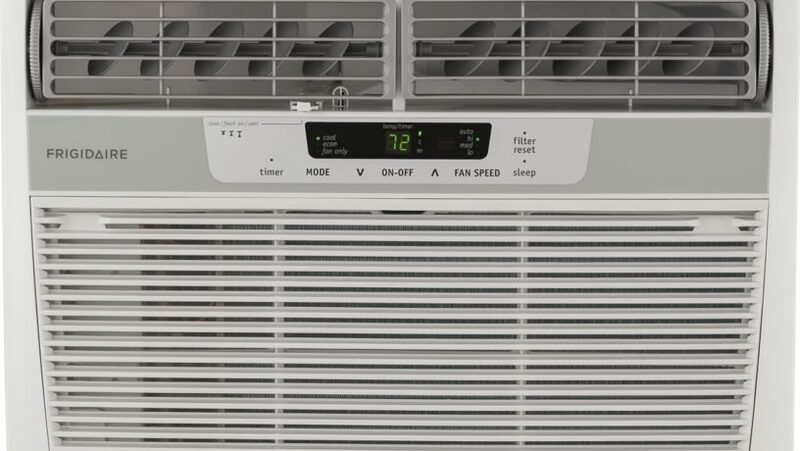 This window air conditioner will fit windows between twenty-three inches up to thirty-six inches in width. While the height doesn’t really matter as most windows are taller than the air conditioner this unit comes in at fourteen inches. Please be sure to measure your window before purchasing so you don’t accidentally buy the wrong sized product. It also comes with side curtains and insulation strips to prevent any leaks or air from coming in from outside. It does not come with an outside mounting bracket but it is not needed as the unit only comes in at sixty pounds. This unit uses the HFC R-410A for it’s refrigerant. This is a VERY common refrigerant that is found in most offices and homes across the country. If you do need a repair down the road you don’t have to worry about finding or paying an arm and a leg for a refrigerant refill. The FFRA1022R1 comes with a cool and economy mode. The cool mode does just that, it cools the room to your desired temperature. The economy or ‘econ’ mode will cool your room to the desired temperature and then turn on again when the temperature begins to rise. This is a great feature to have for those of us who go to work during the day and want to come home to a nice cooled room. The most satisfying part about this Frigidaire unit is the price point. As I write this the price on Amazon is in the two-hundred dollar range. (Prices are subject to change at any time.) That is quite the bargain especially when you look at other 10,000 BTU units on the marketplace today. You also get the Frigidaire brand name that has a century of reputation behind it. Something else to take into consideration when it comes to air conditioners is if they are Energy Star Certified by the Environmental Protection Agency. When a product is Energy Star Certified it means that that product has met strict energy efficiency guidelines set fort by the US EPA. A Energy Star certified unit will have higher seasonal energy efficiency ratios as well as having improved energy efficiency ratios. The FFRA1022R1 is NOT Energy Star Certified with the EPA. While this is a downside I should point out that the Energy Efficiency Ratio is rated at 10.9. That is nearly 1.0 above the EPA’s recommended 10.0 rating. So, while you are not Energy Star certified with the EPA you do get an energy efficient machine that exceeds EPA expectations. The FFRA1022R1 comes with basic settings such as sleep mode, twenty four hour on/off timer, a remote control that comes with two triple a batteries, varying fan speeds, and cool/econ/fan only cooling modes. While most of these modes and options are pretty standard I am going to point again to the price point on this unit. For an 10,000 BTU with these features at this price you are saving a lot of money while getting all the standard features. The last feature I’ll mention on this Frigidaire unit is that it comes with a one year manufacturer warranty. This is a great insurance policy if for whatever reason your new unit doesn’t last the year. There are always outliers out there and having this warranty to back you up ensures you that your investment is protected. This is an 10,000 BTU window air conditioner. I mentioned this above in our product features section but you should be aware that this unit is rated to cool a four-hundred and fifty square foot room. If your room is bigger than that then you should look at getting a larger BTU unit. 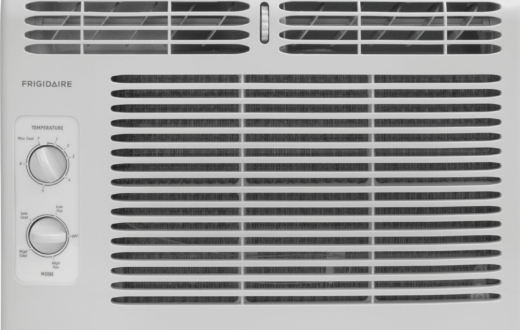 If you are unsure of what sized unit you need please check out our window air conditioner buyer’s guide which can be found by clicking here. When buying things online there is always risk of damage from the transport carrier. This is moreso when you are dealing with a machine with a lot of moving parts like an air conditioner. While most people who order this item receive it in fine condition there is still the risk of the unit arriving to your home damaged. If this does happen then I would recommend filing a complaint with Amazon on your order. If you aren’t having any luck in that avenue then you could file a claim on Frigidaire’s website under their one year warranty. The last complaint that I have found in my research is that through usage and the passage of time the fan can become loosened and begin rubbing up against other components of the unit. While this isn’t a big deal mechanically it does result in a larger noise when the air conditioner is running. So, if this happens to you you may have a noisy unit to contend with. While this may not matter during the day it may make it difficult to sleep with if the FFRA1022R1 is in your bedroom. Overall I would say that if you are looking for a new window unit that will cool your living room, master bedroom, or small apartment then this would be a great fit for you. It comes with all of your standard features you would need on an air conditioner as well as coming in at a great low price point. If you would like to purchase or learn more about this unit then please click here to be taken to Amazon’s product page. 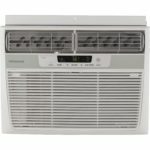 If you find that your room is too big or too small for this unit then I would recommend checking out our official RefrigerantHQ Window Air Conditioner Buyer’s Guide by clicking here. 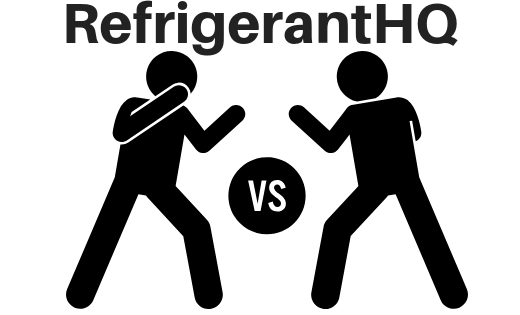 How Much Is Refrigerant Per Pound In 2019? Are Window Air Conditioners Dangerous?